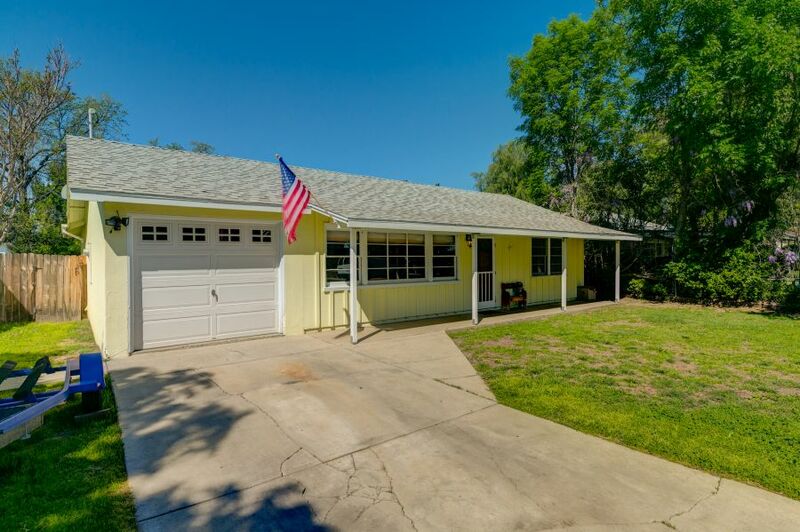 Located in the City of Ojai on a tree-lined street across from Soule Park Golf Course, this ranch-style home offers easy access to all that makes the Ojai lifestyle so special. From here, you can walk, bike or drive just about one-half mile to reach The Arcade shopping center, Ojai’s local farmers market, Libbey Bowl, and the eclectic shops, galleries and restaurants of the downtown Ojai village area. There is a spa and restaurant just down the street, a golf course just across Ojai Avenue, and several shopping and dining options that are even closer than the main hub that surrounds The Arcade. As you step into the living room from the covered front porch, natural light flows through large, wood-framed windows to bathe the interior. To the right, a short hallway with a coat closet and linen closet leads to two guest rooms with large closets and ceiling fans, as well as the remodeled guest bathroom with a tile shower and floor, built-in shelves and pedestal sink. Accessed from passageways at either end of the living room, the remodeled kitchen features tile counters, lots of cabinets and a breakfast bar that provides ample workspace or the perfect spot for friends to gather while you put the finishing touches on dinner or mix cocktails. A skylight adds natural light to this central space and, as an unexpected bonus, there is a large laundry room with a tile counter, plenty of space to fold clothes and lots of storage cabinets just off the kitchen. For many homes in this area, this may be where you would expect the living area to end; however, thanks to a large addition built in approximately 2002, this particular home has much more to offer. 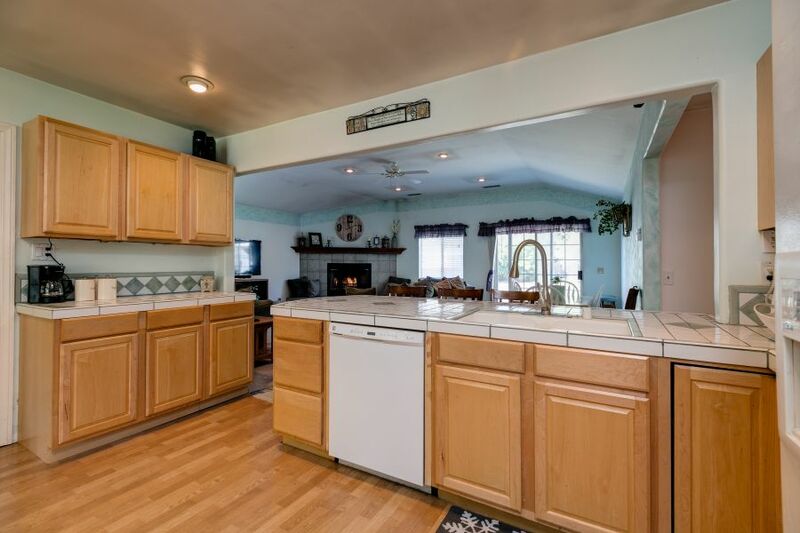 Just across the breakfast bar, the kitchen opens to the dining area and a spacious family room where all eyes are sure to be drawn to the corner fireplace with a tile surround and hearth. The addition also includes a private master suite with a large, walk-in closet and an en suite bathroom with a lavatory alcove, built-in linen cabinet, and tile floor, counter and surround for the combination shower and bathtub. In the main area, there is plenty of room for a large bed, as well as a sitting area or an area dedicated to yoga, meditation or a favorite hobby. Outdoor living areas include a covered front porch with room for a seating area and a large patio accessed through a sliding door in the family room that leads to the backyard. Beyond the patio, there is a large, open space just waiting for a vegetable garden or other leisure pursuits. There is also an attached, single-car garage and an area next to the garage that could potentially accommodate a small RV, boat or other vehicle. 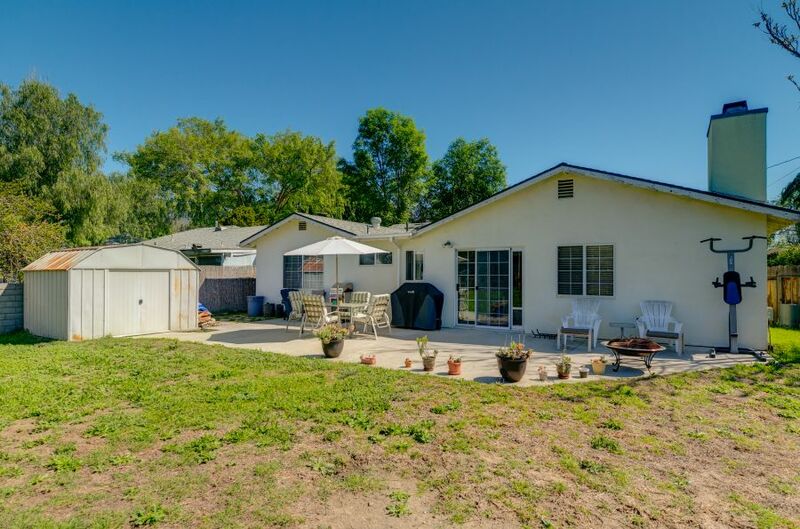 If your search for Ojai homes for sale is centered around homes close to downtown Ojai’s shops, restaurants, art galleries and spas, you definitely need to add this one to your list of homes to consider. An added bonus with this particular home is that it offers the opportunity to personalize both the indoor and outdoor spaces to fit your needs and style. For more information or to schedule a showing, contact Nora today.